Dibujo Tinta de 1957... Flowing lines that create unforgettable works. The works of Eduardo Chillida (1924-2002) represent nowadays, one of the finest of the fine arts of the second half of the 20th century. Nani Marquina so dedicated a collection to Eduardo Chillida, designing a collection based on his work, from the Human Figure in 1948, through Dibujo Ink 1957 and Collage 1966, Mano and Manos 90s and Gravitation 1993 and 1994. "Art is what has not been done, what they do not think. 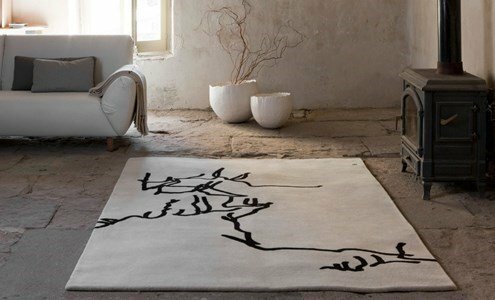 All works have been transformed into carpets with maximum accuracy and all made by hand, using different techniques and materials such as wool, silk, mohair, to give texture and show the essence of his work, offering the deserved value. Has density of 124.000 knots/m2. The height of the pile is 10mm and the total height of the rug is 16mm, weights 4,5 kg/m2.